Following up a Gold record is hard, especially with a sophomore album. The sophomore album is always the test for bands. Many don’t make it pass this one, but it looks good for the trio of Kittie. From the very first track you know this album has a very mature value to it. 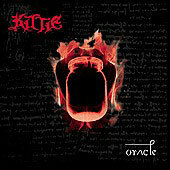 Kittie has definitely matured from the last album. The drums and guitar have a fuller sound to them and again the guitar gets thrashy at times which is a bonus because you don’t hear that much anymore. This album has a very up in your face heavy metal with to me some thrash metal mixed in. A good direction for metal and hopefully some other bands emerge from hearing this release. Some down siders to this album have to be the repetitive sound and riffs throughout the album. They get old after the Pink Floyd cover, but overall this album is a good album for a sophomore release. If you are a Kittie fan or even like metal, I would BUY THIS. I give it a two thumbs up.